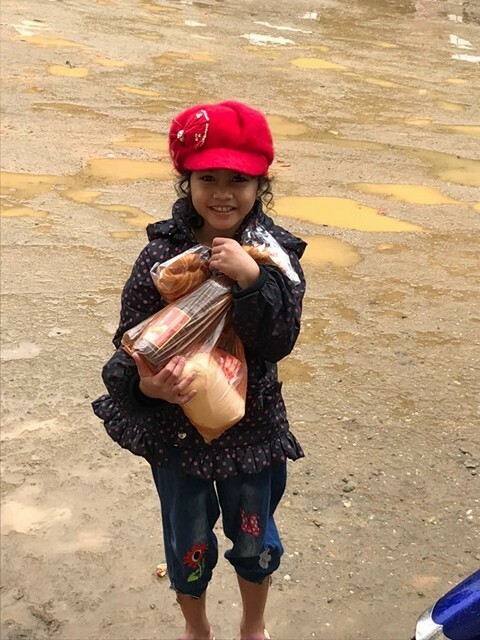 This post is written by MEPN students and guest writers, Katie Lam, Anne Uyen Tran-Ho & Dana Yu on the USD trip to Vietnam. After a day of facing constant waves of oncoming motorbikes and cars we learned how to properly cross the busy intersections of Saigon with the assistance of kind locals. USD nursing students Katie Lam, Anne Uyen Tran-Ho, Dana Yu, and faculty Professor Molly McAmis and Dr. Lyn Puhek set off for Da Nang with the International Medical Relief (IMR) organization. In Saigon, we held a team meeting and prepared to set up the clinic for our destination, a rural community located to the northeast, five hours away with a population of 26,000 people. The team loaded up onto six vans, and we set off on our long trek. Rain fell throughout our drive up the mountains, and modern civilization slowly faded away into canopies of banana trees but also muddy roads. Stationed in a rural setting with few facilities and a large, overworked population of farmers, our health care services, education, and food donations provided a valuable service to the community. Over several days, we set up a clinic in the neighborhood auditorium. The windows, with a scenic view overlooking the foggy mountains were lined with spider webs and bees. We worked with an amazing, well-rounded team including nurses, nurse practitioners, physician assistants, doctors, EMTs, dentists, and Vietnamese translators. With such a variety of strengths, we worked collaboratively to triage, assess, and provide care to 700 patients who walked or traversed long distances on motorbikes, up the windy mountain paths in the rain, arriving at 2 am for the opportunity to receive care and a bag of food for their family. The role of the USD nursing student included intake of vital signs, triaging patients, doing well-baby checks, running labs, and providing health related community education. However, we could not have done any of this without our amazing team of Vietnamese translators. At the clinic, we assessed a variety of patients, ages ranging from a few months to 100 years old. We saw many interesting patients including a case of scabies, infected g-tube, and the saddest case we saw was a 9 year old male with an abdominal tumor. With a limited supply of equipment and mere desks and chairs in the clinic, we were forced to create solutions with what we had available, not only in our assessments but also in our plan of care. A family, all with rashes, was not an uncommon sight during our work. When a family of three came in with a rash, the initial assumption was measles. However, upon further assessment, the family practitioner determined the family was infested with scabies. The pediatric patient had scabies for 4 months, and his sister had similar findings for 8 years. The rash covered the entire body of the infant, but he didn’t seem to be in pain. The family was given some medications and recommendations for hygiene. There was a gentleman who arrived to the clinic with an infected G-tube. After being prescribed a course of antibiotics, the patient was sent to the nursing team to clean up the infected area. Due to the limited and cramped setting, it was difficult to find a private treatment area. We were eventually able to find a private room with a table used as a makeshift bed. As we were cleaning the area, we noticed that the patient hooked the end of his G-tube to his necklace to keep it in place, which demonstrated the resourcefulness and creativity of the patient. After the cleaning, he was sent back to the provider area for electrolytes and a referral to palliative care. Overall, this has been an eye opening and humbling experience. There is so much that we take for granted, all the while our hearts are warmed when the patients expressed their appreciation. Many of them left the clinic with a smile, their food donations in hand and waved as we passed by them. The community even threw us a New Year’s Party. This was a fulfilling trip for everyone involved. It has been so rewarding to help the underserved, and the experience has truly showed us what global nursing really is all about. This entry was posted in Class of 2017, Class of 2018, community involvement, Guest Writer, Hahn School of Nursing, International Program, Uncategorized and tagged Community Outreach, Guest writer, International nursing, MEPN Class of 2017, MEPN Class of 2018. Bookmark the permalink. Wonderful work! So proud of everyone!